Fiat's plans to build 140,000 cars a year in China is small for a market with monthly sales of 800,000. MILAN(Reuters) -- Fiat S.p.A. needs to find a better route into the booming Asian car markets if it wants to catch its competitors and seal a place among the top global automakers. Fiat can't rely on its recently acquired 20 percent stake in Chrysler nor its own strength in Brazil to compensate for shrinking or stagnant sales in developed markets. "The fact that Fiat has practically nothing in Asia, especially right now as that's the only region in the world with reasonable growth, is clearly a structural weakness for them," said a London-based analyst who declined to be named. Fiat's global competitors such as General Motors Co. and Volkswagen AG are already top sellers in China -- now the world's biggest car market -- as they seek to compensate for stalled demand in the developed world. Although the Italian automaker, whose business also includes the Lancia, Alfa Romeo and Maserati brands, does have partnerships in China and other fast growing markets such as India and Russia, these are not seen as enough to shift it up the global auto maker league. "If you want to grow as a carmaker, you have to have a pretty credible strategy for emerging markets," with Asia a key part of that, said Michael Tyndall, an analyst at Nomura. "In Asia, Fiat is well behind the curve." Fiat's deal with Chrysler could take it to the No. 5 slot globally with sales of about 4.2 million units -- still short of the minimum 5.5 million units Fiat CEO Sergio Marchionne has targeted for survival. Fiat took a 20 percent stake in Chrysler, the third-largest carmaker in the United States, in return for handing over its small car technology to rescue it from the brink. Marchionne also heads the American company and has said he feels "reasonably comfortable" the two companies can achieve his survival target. Through the link-up Fiat hopes to sell some of its own brands in the United States. "You can't bet the farm on Chrysler. Chrysler's survival over the next two to three years is far from a given," said a second auto sector analyst who asked not to be named. Adam Jonas at Morgan Stanley thinks Chrysler is key to Fiat's future and has strong potential. "Longer term, Chrysler can make money. It could be extremely profitable by the end of 2010 if the U.S. market grows sharply," Jonas said. Elsewhere in the world Fiat's existing operations are seen as having limited potential. In Brazil, Fiat's second-biggest market after Italy, sales have been resilient and expectations are for a rise of about 6 percent this year. But in July, total sales in Brazil slipped 0.9 percent from a year ago after a tax incentive scheme to buy cars was extended to the end of the year. "Brazil's fine but it's quite an isolated success story. It doesn't immediately throw you opportunities to build up that success in neighboring countries," said the second unnamed sector analyst. In India, another fast-growing automobile market with sales of about 1.5 million vehicles annually, Fiat has a factory venture with Tata Motors Ltd. with capacity to produce 100,000 cars and plans to sell a mid-sized sedan and the Grande Punto subcompact hatchback. "Right now, Fiat is using Tata Motors as a kind of support ... to penetrate the market," said Deepesh Rathore, analyst with IHS Global Insight. "The Grande Punto is a good start. But they need some other products ... they are a very small player now." In Russia, Fiat has a joint venture with Sollers but doesn't make it into the top 10 foreign automakers based on sales volume. Russia's car sales slumped 58 percent in July to 115,483 units. Fiat brand sold 1,142 units. Fiat has already made some attempts at establishing a presence in China but faces a major decision as to the best route forward. Last month, it signed a deal with Guangzhou Automobile Industry Group, which included plans for a plant to produce an initial 140,000 vehicles a year. 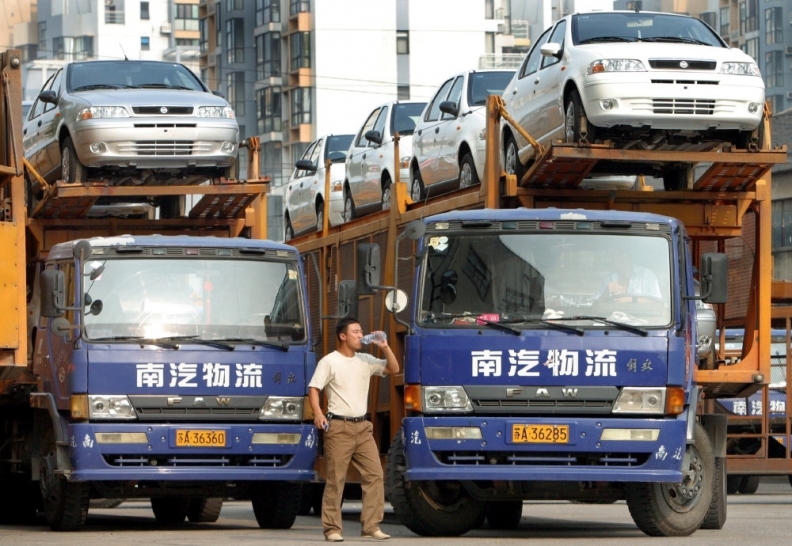 This compares with China's total monthly sales of more than 800,000 vehicles. Earlier, Fiat had a deal with Chery, China's biggest domestic carmaker, but this was put on hold in March. "China is a key market globally and we are very pleased with the deal signed with Guangzhou Auto. Guangzhou Auto is a very credible and successful player in the Chinese market," Fiat spokesman Richard Gadeselli said. Some analysts say a tie-up for Fiat with Beijing Automobile Industry Corp. (BAIC), which missed out on buying GM's Opel unit in Europe, could help. BAIC produces about 1 million vehicles a year or about 10 percent of China's sales. It already has ventures with Hyundai Motor Co. and Daimler AG for Mercedes-Benz cars but would have invested 660 million euros for 51 percent of Opel. A partnership with Fiat could benefit both. "Beijing Auto gets hold of the brand, the small diesel engine technology, access to European and Latin American markets through the Fiat distribution system. It would certainly be good for them," said the first sector analyst. "In return, Fiat gets cash, access to China and potentially a low-cost production base," he added. A spokesman for BAIC said it had no knowledge of a possible tie-up with Fiat. But Huang Zhirui, an analyst at CSM Worldwide, said Fiat should concentrate in the short term on the partnership with Guangzhou. "It is more realistic for Fiat to focus on the joint venture with Guangzhou Auto and make sure it really takes off rather than rushing into other ties," he said, adding "it makes sense for Fiat to explore new ties in the longer term." Fiat is unlikely to see a positive impact from its Guangzhou venture until after 2012, analysts said, when it could reasonably look to have about 1 percent of the market.